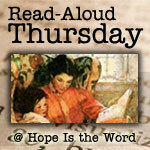 We've started preparing for our favorite sweet holiday by reading a couple Valentine's Day picture books. Both books feature homemade valentines. You can't get too fancy when it comes to Valentine's Day. Fancy Nancy: Heart to Heart is one of the newest paperback books in the popular Fancy Nancy line and it even includes stickers. Nancy and her friend Bree make "magnifique" homemade valentines for school using sequins and doilies. When Nancy receives a special valentine from a secret admirer, she tries to discover its origin. Kids can use the sheet of stickers in the back of the book to decorate their own valentines or apply them to the pages of the book. Grandma always buys these inexpensive and cute Fancy Nancy sticker picture books for my daughter, and we received this Valentine's Day book from her earlier this week. (I didn't tell her that HarperCollins had sent us one previously. We're giving the extra copy to a friend.) The stories are short but sweet and the books really do make a nice holiday gift for preschoolers on up. My daughter also really enjoyed the Halloween...or Bust! book published last year. 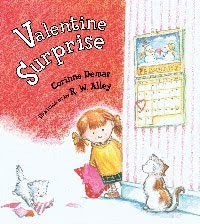 One of my newest favorite Valentine's Day picture books for preschoolers is Valentine Surprise by Corinne Demas. I won a signed copy of the book from Bookin' With Bingo last Christmas. The book is about a little girl named Lily that wants to make the perfect valentine for her Mommy. With Valentine's Day only a week away she sneaks to a corner of the house and sets to work. Each day of the week, Monday through Sunday, she cuts out a valentine hoping to craft the perfect heart. Eventually she discovers what makes a perfect Valentine. R. W. Alley's cute, cartoonish illustrations are full of emotion and color. The two playful kittens, shown trying to help little Lily out with the valentines, made us smile. The little girl in the book reminds me so much of my daughter. She loves cutting out and decorating homemade Valentines all by herself. Of course I cherish them all, each one given from the heart. This book works wonderfully for this year's Valentine's celebration because it lands on Sunday, just as it does in the book. 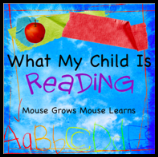 The book also can be used as a way to teach the days of the week. 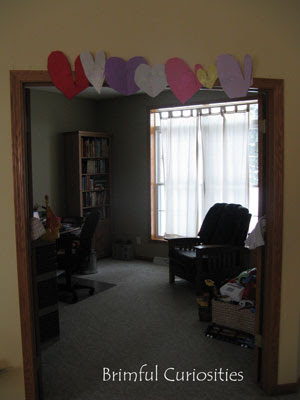 For our stART (story + art) project this week, my daughter made a seven-heart banner like the one found in Valentine Surprise. She's really proud of her creation. She cut each heart out by herself from construction paper and taped them all together. Her heart cutting skills greatly improved with all the practice. We put the banner above the door to our den. It's a very cheery homemade Valentine's Day decoration! I love her banner! Isn't that the cutest book! Very festive banner! I love that you displayed it so prominently in your house - it really says "good job". I'm so glad you linked up your Valentine's DAy picks! My girls really like Fancy Nancy, but we don't have that book. What a great banner, I love how it looks hung up like that :0) Thank you for sharing these great Valentine's Day books and linking up to stART this week! My daughter loves Fancy Nancy! I haven't seen this book yet, and it would make a great Valentine's gift for my own little Fancy Nancy! I love the banner - your daughter is pretty crafty. 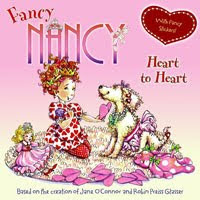 We are not big fans of Fancy Nancy here, but the other book sounds cute, and we will look for it. Thanks for sharing!